Sarmad Tariq, the motivational speaker, life coach and the ‘chair man’ has touched many lives through his experiences of hardship and writings. As my life partner for the last 13 years, I have also learnt a lot from him. 1. Do not form an opinion about people on the basis of how they look, what they wear or their general demeanour. Every human being has some positive qualities that can only be discovered if we allow ourselves to do away with the judgments and discover those qualities about them. 2. Do not waste your energy and time on getting angry and worked up about the little things in life. Save it for things that really matter. And when you let your anger out, express to show your care not disrespect. 3. Do not let your fears, complexes and anxieties keep you away from pursuing what your heart tells you to. Time will not wait and there will be no tomorrow, so just do what you have to do and the rest will follow. 4. Do not let your challenges become your excuses. Seize them as opportunities that need to be explored and given meaning to. 5. Do not follow your passion, hobbies and interests half-heartedly, without full knowledge about them. If you ride a bicycle, a jeep, dance, learn all about its history, mechanics and the works because it’s only through this learning that you will excel in the passion. 6. Do not let the child or teenager in you die as you age. Allow yourself to feel the excitement about the small, the silly and fun things in life no matter what age you are. 7. Do not find excuses for doing or not doing something that you did not want or wanted to do. While your age, gender, class, disability may make things tough for you, it’s not a good enough excuse. 8. Do not waste your time ‘flipping through the TV channels’. There needs to be a purpose behind what you do and that purpose, no matter how big or small, should make sense to you. So, even when you watch a movie, listen to music, meet your friends, you of all people should know why you are doing it. 9. Do not take your loved ones for granted so keep telling them how much you love, adore and care for them. 10. Do not try to control the thoughts, opinions and lives of your loved ones. Let them live the way they want to as they are responsible for their lives. Your concern for your loved ones should not cross the boundaries of their personal space. Emotional black mail and self-pity are tools of destruction, not construction. Sarmad Tariq was an exceptional human being. In the days since his passing, many previously unacquainted people have come to know, first, of him, through the wide outpouring of tribute by those whose lives he touched; and then about him, not just from people he knew, but directly in his own words. His writings are a legacy that are enabling more people every day to hear him, a man who allowed tragedy to dictate his life in a most unconventional way: by living it. Sarmad’s story and his achievements – as an athlete, as a motivational speaker and as a writer – have been well documented. An aspiring boxer at 15 years of age, he fell victim to an accident that left him paralyzed from the shoulder down. Months of medical complications and treatment had to be borne by him and his family, on top of the new reality that he would never stand, never walk, never run again. Devastating knowledge of this nature, the seeming affirmation of a life of limitation and dependence, could have beaten Sarmad down; but he rejected it. What followed was a series of uphill battles, from pursuing higher education to learning to drive a specifically modified car. Alongside mastering personal challenges, Sarmad had to learn to mollify and overcome the well meant fears and unconsciously adverse advice of the people who loved him and did not want to see him hurt. Sarmad, however, would not be cowed down by pessimism and refused to acknowledge the word ‘impossible’. He earned an MBA degree, landed a job and, in his early 20s, married the woman he fell in love with. Zehra Kamal, Sarmad’s wife, is a practicing clinical psychologist; she also works in the development sector, with expertise in gender violence and youth issues. 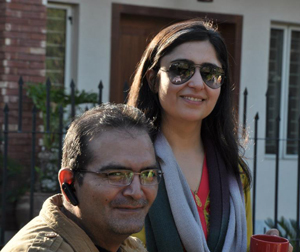 Her and Sarmad’s fathers were in the army and their families were neighbors when they lived in Quetta. This was before Sarmad’s accident. Some years and several army postings later, a conversation with a mutual friend led Zehra to reconnect with him. It took them less than a year to realize that they wanted to marry. Both had their concerns owing to the particular circumstances they would face, but the concerns were with respect to the comfort and ease of each other. They did not need long to make their decision, though, and welcomed the support of both their families. Sarmad was not a man who would covet others what he couldn’t do; there was no pettiness, only the genuine desire to see others achieve. “He was very big hearted that way,” says Zehra. “This was particularly admirable in his case because there was so much he wanted to do but was held back by his body.” His interests ranged in everything from sports, music and writing to cars and bikes. He never let it translate, however, into bitterness or frustration, always adjusting with ease and focusing on the next thing he wanted to achieve. 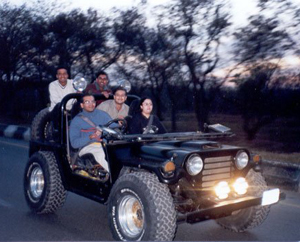 Both being tremendously outdoorsy, a number of their activities revolved around athletic sports, be it bike riding, Sarmad’s well-known marathon runs, or off road excursions in their jeep. With everyone he knew, Sarmad was a man who encouraged the pursuit of objectives. Passionate of living life and acutely aware of the smaller blessings, he had no patience with people who complained or were lazy and refused to help themselves. It disappointed him to see people who were able bodied but didn’t pursue opportunities to grow and take advantage of what they had. Kamran Rizvi, founding director of the management consulting and training firm Navitus, met Sarmad when the latter was working at the HR department in an oil and gas company. An unerring sense for potential turned him onto Sarmad’s capacities. Sarmad expressed an interest in working in the training and consulting field and Rizvi encouraged him to take up the mantle of life coach and motivational speaker. This turned out to be a calling of sorts and was so successful a venture that many people began approaching Sarmad with ideas for creating a foundation or an NGO for physically challenged people. But to all of them his answer would be that simply because I’m trapped in a wheelchair does not mean that this is all that I’m about or this is all I want to channel my energies into and let define me. For a man who consistently surpassed obstacles as a way of life, Zehra feels Sarmad’s biggest challenge was that of physical endurance, and he had a tremendous capacity for it. But it wasn’t just the marathons or the drive from Khyber to Karachi or the specially built machine to accompany other bike riders. “There were people who thought of his story as glamorous in some ways. Here was a man who, by refusing to let a disability define him, was now an individual whose achievements had brought him fame and accolades. I think this came from the fact that Sarmad would make everything look so effortless. But what a lot of them didn’t realize was the day to day challenges he had to deal with, the bodily complications he’d been living with every day for years,” says Zehra. For his part, Sarmad simply kept at it, invoking his faith and his belief in self to boost him forward, right up to the last days. Can someone you’ve never known, someone whose name you’ve never heard of, inspire you enough to rethink your entire life? When I logged on to Twitter this morning, I found my timeline flooded with people mourning the death of Sarmad Tariq and talking about what a great person he was. Initially, I didn’t care much. I mean, people die all the time. Famous people die too. And everyone sings their praises after they are gone. There was nothing very interesting about this news. But after reading a number of tweets, I was intrigued enough to go to his Facebook page. You changed my life #SarmadTariq , you told us that despite adversity what a man can achieve. Such a shame could not ever meet u. “Not a saviour, not a leader, not a role model, just a tough act to follow”. He seemed more like a director or an actor to me at first glance. But there was more to him than what I could see from his display picture. 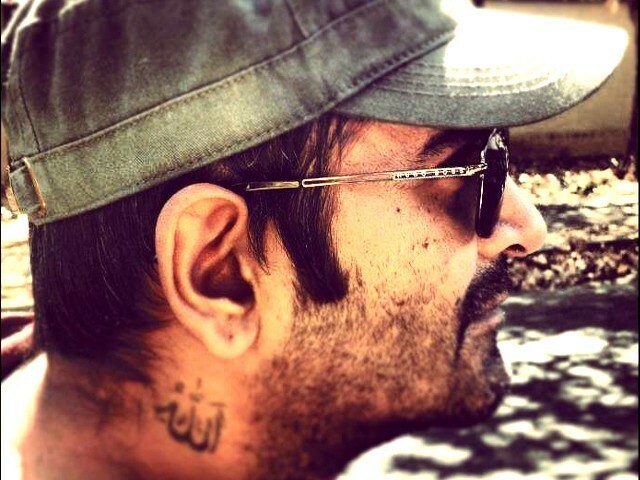 The last post on his Facebook page was an open letter to God, pleading Him for a break from his pain. He was severely sick with multiple diseases but he hadn’t seemed to have lost hope. After reading a few more of his posts about the stark realities of life and death, I was left shaken inside and also felt guilty for not having known of him before, for finding out about him too late and for never having the chance to have met him. 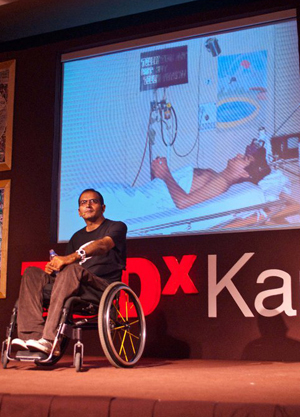 A motivational speaker who was paralysed neck down due to a swimming accident when he was only 15-years-old, Sarmad had travelled the world on his wheelchair, represented the country and most-definitely touched a thousand hearts. That was more than enough I needed to know about him. I had not seen any documentaries about him, had never heard him talk and yet, in a matter of minutes, he became the person I wanted to meet just once; someone to draw inspiration from, to find hope to go through this life and to learn to live it to the fullest. 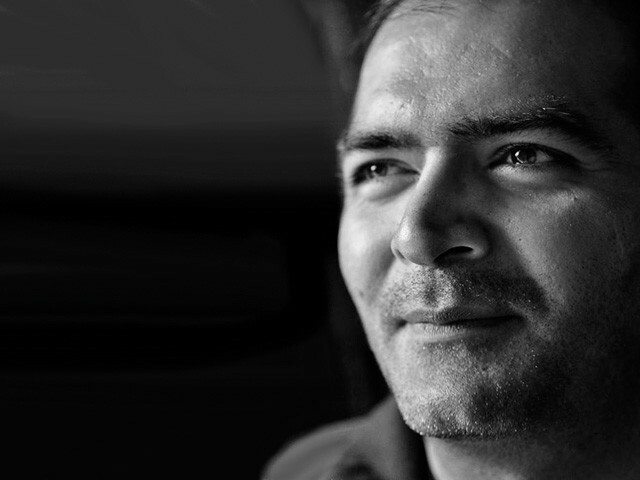 To me, Sarmad seemed like a person who had ‘life’ figured out. He didn’t just know but was constantly aware of the fact that death is imminent. He was prepared for it and wanted to make the most of every single moment of his life. Sarmad may have left this world, but he is not ‘dead’. And just like in life, his death is a lesson for all of us on how to live. 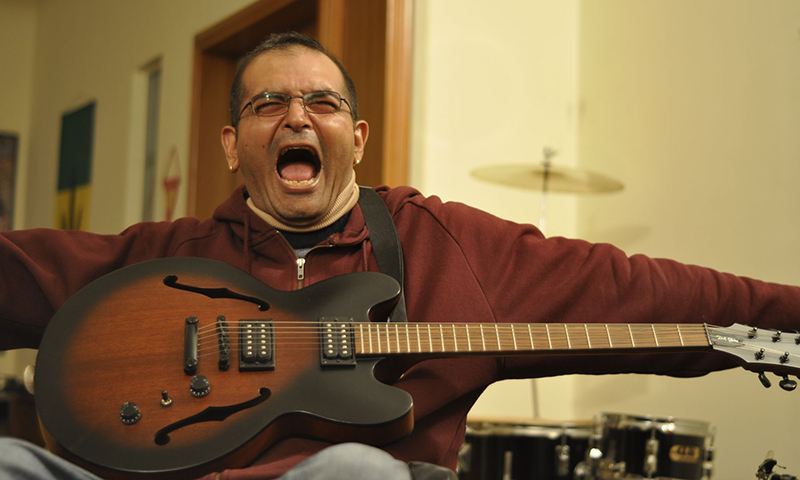 Rest in peace, Sarmad Tariq.